Lenalidomide has been shown to be potentially teratogenic in thalidomide-sensitive animal species. Screening for thalidomide analogs devoid of teratogenicity/toxicity—attributable to drug metabolism and disposition, but having immunomodulatory properties—is a strategic pathway towards development of new anticancer drugs. Plasma concentrations of lenalidomide were investigated in immunodeficient control and humanized-liver mice following oral administration of lenalidomide (50 mg/kg). Plasma concentrations of lenalidomide (1-2 hr after administration) were slightly but significantly higher in humanized-liver mice than in control mice (p < 0.05). Human albumin mRNA, a liver-specific toxicity marker, was found in the blood of humanized-liver mice 24 hr after lenalidomide administration. Simulations of human plasma concentrations of lenalidomide were achieved with simplified physiologically-based pharmacokinetic models in control and humanized-liver mice or by the direct fitting analysis of reported human data, in accordance with reported lenalidomide concentrations after low dose administration in humans. The results indicate that pharmacokinetic profiles of lenalidomide, a compound resulting from introducing one aromatic amino group into thalidomide and removing one keto group, resulted in less species variation in in vivo pharmacokinetics in control and humanized-liver mice and that immunodeficient humanized-liver mice can serve as experimental model animals for human liver injury in drug development at high doses, with human albumin RNA analysis in plasma. Lenalidomide (Kim and Schmidt-Wolf, 2015; Chen et al., 2017), a second-generation amino analog of thalidomide, has been recently approved for refractory multiple myeloma in the United States, Europe, and Japan. Lenalidomide, in combination with dexamethasone, has reportedly improved outcomes for multiple myeloma (Chanan-Khan et al., 2012; Weber et al., 2007). Pharmacokinetic analysis of lenalidomide after a single oral dose in healthy male subjects has been reported (Chen et al., 2012a, 2012b). In contrast to the cases of the first-generation drug thalidomide and another second-generation drug, pomalidomide (Chowdhury et al., 2014), no metabolites of lenalidomide were detected in in vitro assays although limited levels of 5-hydroxylenalidomide were detected in vivo, in a similar manner with the case of 5-hydroxythalidomide trapped in vivo by glutathione (Yamazaki et al., 2012) and non-specific proteins (Yamazaki et al., 2016a) and 5-hydroxypomalidomide and its glucuronide (Shimizu et al., 2017). The ubiquitously expressed E3 ligase protein cereblon has been reported to be one of the common direct protein targets for antiproliferative activities of thalidomide, lenalidomide, and pomalidomide (Ito et al., 2010; Lopez-Girona et al., 2012). Useful applications of immunodeficient mice (Hasegawa et al., 2011; Yamazaki et al., 2012) with transplanted human hepatocytes (humanized-liver mice) were reported for the metabolism of thalidomide (Yamazaki et al., 2016b) and pomalidomide (Shimizu et al., 2017). Screening for thalidomide analogs devoid of teratogenicity/toxicity (especially those formed by auto-induced cytochrome P450 3A enzymes (Yamazaki et al., 2013; Murayama et al., 2014)) but having immunomodulatory properties is a strategic pathway towards development of new anticancer drugs. Liver-specific albumin mRNA in plasma has been proposed as a biomarker of drug-induced liver injury in rats and humans (Okubo et al., 2013, 2016). The objective of the current work is to study the effects of introduction of an aromatic amino group into thalidomide and removal of one keto group (i.e., lenalidomide) on the in vivo pharmacokinetics and simulation for human plasma concentrations of lenalidomide using a simplified physiologically-based pharmacokinetic (PBPK) model with data from control and humanized-liver mice, in a similar manner to the cases of thalidomide and pomalidomide, as well as literature data in human subjects. Changes in human albumin mRNA in plasma from humanized-liver mice were also detected, using the human-specific primers. Chemicals were from sources reported previously (Murayama et al., 2014; Chowdhury et al., 2014). Commercially available human differentiated cryopreserved HepaRG cells, mouse cryopreserved hepatocytes, and Williams E medium were obtained from Biopredic International (Rennes, France). Male control and humanized-liver immunodeficient TK-NOG mice (20-30 g body weight) (Yamazaki et al., 2016a; Nishiyama et al., 2015; Shimizu et al., 2017) were used in this study. In humanized-liver mice, > 85% of the liver cells were estimated to have been replaced with human hepatocytes (a 30-year old female, Lonza TRL, Walkersville, MD, USA) in TK-NOG mice, as judged by measurements of human albumin concentrations in plasma. Blood samples (~ 30 µL) were collected at times of 1-24 hr (following injection) with BD intramedic polyethylene tubing (Thermo Fisher Scientific, Waltham, MA, USA) after single oral doses of lenalidomide by gavage (50 mg/kg, 10 µL 0.5% (w/v) methyl cellulose 400 solution per g body weight, Wako Pure Chemical Industries, Osaka, Japan) administered to five animals in each of two groups. After treatment of the plasma with an equal volume of acetonitrile, the aqueous supernatant was centrifuged at 2 × 103 g for 10 min at 4°C and analyzed using tandem liquid chromatography (LC)-mass spectrometry (MS). The use of animals for this study was approved by the Ethics Committees of the Japan Central Institute for Experimental Animals. LC-MS/MS analyses of lenalidomide were performed according to previously reported methods (Murayama et al., 2014; Chowdhury et al., 2014; Chen et al., 2012a) with minor modifications. A Quattro Micro API tandem mass analyzer (Waters, Tokyo, Japan) was used in the electrospray positive ionization mode, directly coupled to a Waters 2695 LC system equipped with an octadecylsilane (C18) column (X-Bridge, 5 µm, 2.1 mm × 150 mm, Waters). LC conditions were as follows: Solvent A contained 0.1% acetic acid in acetonitrile (v/v) and Solvent B contained 0.1% acetic acid in H2O (v/v). The following gradient program was used, with a flow rate of 0.25 mL min-1: 0-2.5 min, linear gradient from 0% A to 95% A (v/v); 2.5-6.5 min, hold at 95% A; and 6.51-10.5 min, hold at 0% A. The temperature of the column was maintained at 40°C. Samples (10 µL) were injected with an auto-sampler. The retention time of lenalidomide was 5.4 min. Lenalidomide was quantified using the m/z 260.10→149.0 transition for lenalidomide. The levels of human albumin mRNA in humanized-liver mice plasma were semi-quantitatively analyzed by reverse transcription-polymerase chain reaction (PCR). Briefly, total RNAs were extracted from 10 µL plasma taken from blood samples collected with EDTA-coated tubes from humanized-liver mice 24 hr after single oral doses of lenalidomide (50 mg/kg) using an miRNeasy Serum/Plasma kit (Qiagen, Hilden, Germany). Total RNA (0.1-1 µg) was reverse transcribed using High-Capacity RNA-to-cDNA Kit (ThermoFisher Scientific). For comparison, hepatic RNA fractions from mouse and human hepatocytes were applied to confirm human-specific albumin amplification in this study. PCR was performed using DNA polymerase TaKaRa La-Taq (Takara, Shiga, Japan) with an ABI GeneAmp PCR System 2400 thermocycler (Applied Biosystems, Foster City, CA, USA). Thermal cycler conditions included an initial 5-min denaturation at 95°C, followed by 35 cycles of 95°C for 1 min, 65°C for 30 sec, and 72°C for 1 min, with a final 7-min extension at 72°C. The primers used were 5´-TTATGCCCCGGAACTCCTTTTCTTTGC-3´ and 5´-GGCAGACGAAGCCTTCCCTTCATCCCG-3´ for human albumin. The PCR products (146 bp) were semi-quantitatively analyzed by electrophoresis in 4% agarose gels containing ethidium bromide. The images detected on the gels were normalized with arbitrary units in comparison with those of human albumin levels in hepatic HepaRG cells set at 100%. The simplified PBPK model consisted of a chemical receptor compartment, a metabolizing compartment, and a central compartment (Tsukada et al., 2013) and was set up as described elsewhere (Nishiyama et al., 2015; Yamazaki et al., 2016b; Shimizu et al., 2017). Chemical properties of lenalidomide (Table 1) and represent physiological hepatic blood flow rates (Qh) in mice (0.160 L/hr) and humans (96.6 L/hr) were estimated and used, respectively, as described elsewhere (Tsukada et al., 2013; Nishiyama et al., 2015; Yamazaki et al., 2016b; Shimizu et al., 2017). To define similar simplified human PBPK models, values and SDs for the absorption rate constant (ka), the volume of the systemic circulation (V1), and the hepatic intrinsic clearance (CLh,int) shown in Table 2 in the human PBPK model were estimated in two different ways. One was using a scaling strategy from control or humanized-liver mice model to human model as described elsewhere (Tsukada et al., 2013; Nishiyama et al., 2015; Yamazaki et al., 2016b; Shimizu et al., 2017). The rodent ka was multiplied by 0.744 to give the human ka value. The values for V1,human were calculated using the reported equation (Nishiyama et al., 2015) and fixed values of the liver volume (Vh,human, 1.50 L) and blood volume (Vb,human, 4.90 L). The in vivo hepatic intrinsic clearance (CLh,int) in humans was generally estimated by multiplying the calculated initial parameters for in vitro hepatic intrinsic clearance values in humans by the ratio of in vivo to in vitro hepatic intrinsic clearance in control or humanized-liver mice. However, in this conversion process, no consideration was given to interspecies factors when using in vitro liver clearances because the metabolism of lenalidomide was too slow in the in vitro assays (Chowdhury et al., 2014). Table 1. Chemical properties of lenalidomide. The same plasma unbound fraction, blood-to-plasma ratio, and liver to plasma ratio were used for mouse and human (Nishiyama et al., 2015; Yamazaki et al., 2016b; Shimizu et al., 2017). Table 2. Experimental and calculated parameters for PBPK models of lenalidomide disposition. Values in parentheses are standard deviations. Plasma concentration values in subjects were taken from literature (Chen et al., 2012a). where Xg is the amount of compound in the gut, Vh and Vu are the volumes of liver and urine, respectively, Ch is the hepatic substrate concentration, and Cb is the blood substrate concentration. Statistical analysis for the plasma concentrations of lenalidomide in control and humanized-liver mice was done using two-way analysis of valiance (ANOVA) with Bonferroni post tests (Prism, GraphPad Software, La Jolla, CA, USA). Plasma concentrations of lenalidomide in control and humanized-liver mice were measured after oral administration (50 mg/kg) (Fig. 1). Lenalidomide was detected 1 hr following oral administration in control and humanized-liver mice (Fig. 1A), consistent with previously reported findings (Rozewski et al., 2012). Elimination of lenalidomide from plasma was slightly but significantly higher in humanized-liver mice than control mice (Fig. 1A) 1-24 hr after oral administration in comparison of observed plasma concentrations in these time points (p < 0.05). No metabolites of lenalidomide in plasma samples were detected in the in vivo assays under these conditions (results not shown). Based on the present in vivo experiments, the kinetic parameters for lenalidomide disposition in control and humanized-liver mice were calculated (Table 2). By solving the equations for simplified PBPK models, in silico plasma concentration curves following virtual administration of lenalidomide were created in control and humanized-liver mice (Fig. 1A). Plasma concentrations of lenalidomide determined in control (open squares) and humanized-liver mice (solid circles) and virtual curves estimated by control (broken line) and humanized-liver (solid line) mouse PBPK models following oral administration of lenalidomide (50 mg/kg, A). Reported plasma concentrations of lenalidomide in humans (B, C, open circles) and virtual curves by different human PBPK models based on control (broken line) and humanized-liver (solid line) models (B) and the directly created (solid line) model (C) after oral administration of lenalidomide (25 mg per person, Chen et al., 2012a). Human PBPK models for lenalidomide were set up using an allometric scaling method without consideration of an interspecies factor between in vitro liver clearances (Nishiyama et al., 2015; Yamazaki et al., 2016b) (Fig. 1B). The available reported human plasma data (Chen et al., 2012a), obtained after administration of a single low dose of 25 mg pomalidomide to subjects, could be reasonably estimated after virtual oral administration of lenalidomide to humans in the simplified human PBPK models (Fig. 1B), which were set up based on control or humanized-liver mouse PBPK models. Another set of human PBPK model parameters (Table 2) was calculated by direct fitting analysis method based on reported human plasma data (Chen et al., 2012a), and in silico plasma concentration curves following virtual administration of lenalidomide were created (Fig. 1C). The key pharmacokinetic human parameters Cmax and AUC0-12, taken from reported actual means in 17 individual subjects (Chen et al., 2012a), were consistent with the predicted human virtual Cmax and AUC0-24 values extrapolated from the three human PBPK models, supporting the relatively good fitting results (Table 3, within roughly a two-fold range of predictions in the current system). This study demonstrates that pharmacokinetic profiles of lenalidomide were roughly similar between control and humanized-liver mice and reported human healthy subjects (Fig. 1). Table 3. Summary of pharmacokinetic parameters of taken from literature and calculated after virtual oral administration of lenalidomide (25 mg) to humans. Values taken from literature were geometric means for 17 male subjects (Chen et al., 2012a). In the case of thalidomide reported previously (Yamazaki et al., 2012), the human primary 5-hydroxy metabolite was further oxidized to reactive metabolite(s), in addition to the formation of rodent specific 5´-hydroxythalidomide. Although the in vivo metabolic profile of thalidomide was slightly affected by endogenous mouse P450 enzymes responsible for transforming rodent specific 5´-hydroxythalidomide (Yamazaki et al., 2012), the metabolic profiles of thalidomide in human plasma were successfully simulated by the human PBPK model based on only the humanized-liver mice PBPK model (Nishiyama et al., 2015). Introducing one aromatic amino group into thalidomide—to yield pomalidomide—resulted in species dependent-glucuronidation in control and humanized-liver mice, but the major metabolic profile of pomalidomide in humans can be extrapolated with both control and humanized-liver mice PBPK models (Shimizu et al., 2017). On the other hand, lenalidomide has been reportedly excreted mainly by renal clearance, dependent on individual renal function (Chen et al., 2007). Eliminating one keto group from pomalidomide—to yield lenalidomide—resulted in renal clearance-dependent of the drug in in vivo pharmacokinetics in control and humanized-liver mice (Fig. 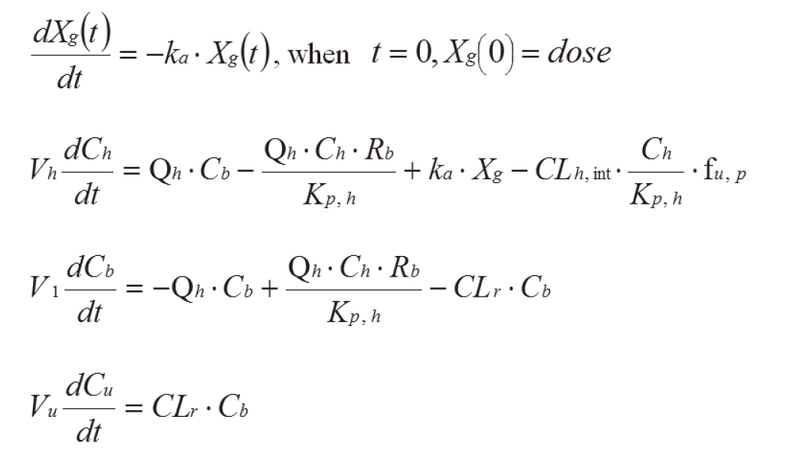 1), which can be extrapolated to pharmacokinetic profiles in human situations by PBPK modeling. In our preliminary studies, the reported primer sets for albumin mRNA detection (Okubo et al., 2016, 2013) could react with both mouse and human albumin in vivo. Using the modified primer sets recognizing human specific albumin mRNA (but not mouse albumin mRNA, Fig. 2A), apparent liver injury by lenalidomide to humanized liver was seen by detection of human albumin mRNA in plasma 24 hr (Fig. 2C) after oral administration of a relatively high dose of lenalidomide (50 mg/kg), in comparison to a dose of 0.36 mg/kg body weight in humans (25 mg per subject, Chen et al., 2012a). From Fig. 2C, human albumin mRNA levels were arbitrarily estimated to be 0.11% (± 0.04% standard deviation) compared with albumin mRNA levels in human hepatic HepaRG cells. Under the present conditions, control plasma from untreated humanized-liver mice did not have human albumin mRNA background levels (Fig. 2B). In our preliminary study, another hepatic toxicant (1,4-dibromobenzene, Szymańska et al., 1996) produced detectable levels of human albumin mRNA in plasma from humanized-liver mice 24 hr after a single oral dose of 250 mg/kg (results not shown). The mechanism by which lenalidomide elevates human albumin mRNA in plasma, as a liver-specific toxicity marker (24 hr after oral administration) is currently not known. It should be noted that lenalidomide may cause some acute liver toxicity at the very high doses administrated in humans (50 mg/kg). Prediction of drug induced-liver injury with uncertain dose-response curves in a variety of subjects is one of the challenging aspects in drug development using humanized-liver animal models. Detection albumin mRNA by RT-PCR in hepatocytes (A) and plasma from humanized-liver mice (B, C) performed with human-specific primers. Lanes 1 and 2, RNA from mouse hepatocytes; lanes 3 and 4, human HepaRG cells (A), lane 1, mRNA from one humanized-liver mice untreated with lenalidomide (B), and lanes 1-3, mRNA from three individual humanized-liver mice treated orally with lenalidomide (50 mg/kg, C). Although lenalidomide was eliminated (Fig. 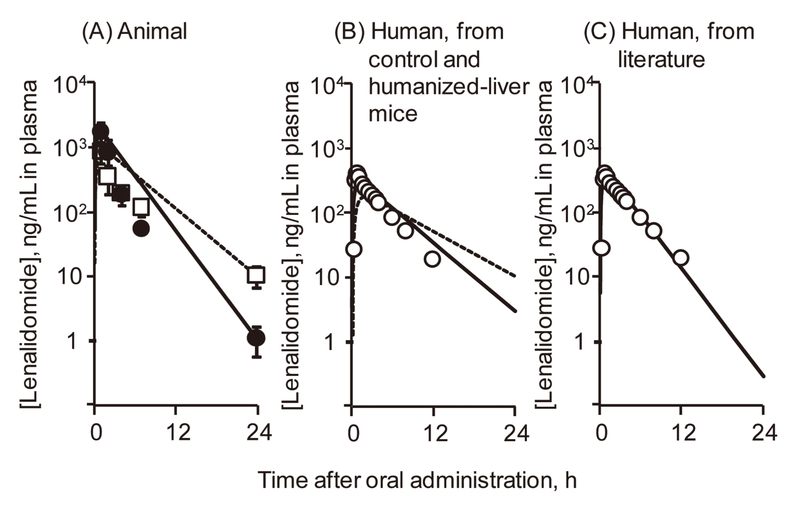 1), as suggested in humans (Chen et al., 2007), the clearance of lenalidomide from plasma (1-24 hr) was slightly higher in humanized-liver mice than in control mice, presumably because of some enterohepatic circulation that might be mediated by mouse liver for lenalidomide (molecular weight 269, close to the threshold molecular weight factor in rodents but low in humans for biliary excretion (Hirom et al., 1972)). In this study, the three-simplified human PBPK models were set up based on control and humanized-liver mouse PBPK models (Fig. 1B) and another direct fitting analysis model (Fig. 1C). In conclusion, the results indicate that introducing an aromatic amino group into thalidomide and eliminating one keto group—to yield lenalidomide—resulted in less species variation in in vivo pharmacokinetics in control and humanized-liver mice, which can be extrapolated to pharmacokinetic profiles in human situations by PBPK modeling scaled with humanized-liver mouse PBPK model. The immunodeficient humanized-liver mice serve as experimental model animals for human liver-injury in drug development with human albumin mRNA determination in plasma with less species variation such as non-clinical toxicity studies with a relatively high dose. The authors thank Megumi Nishiwaki, Nao Yoneda, and Tomonori Miura for their technical assistance. This work was supported in part by the METI Artificial Intelligence-Substances Hazardous Integrated Prediction System Project, Japan, the Japan Society for the Promotion of Science Grants-in-Aid for Scientific Research 17K08425 (H.Y. ), and National Institutes of Health grant R01 GM118122 (F.P.G.). The authors state that there are no interests to declare. The authors alone are responsible for the content and writing of the article. The content is solely the responsibility of the authors and does not necessarily represent the official views of the National Institutes of Health. Chanan-Khan, A.A., Lonial, S., Weber, D., Borrello, I., Foà, R., Hellmann, A., Dimopoulos, M., Swern, A.S. and Knight, R. (2012): Lenalidomide in combination with dexamethasone improves survival and time-to-progression in patients ≥65 years old with relapsed or refractory multiple myeloma. Int. J. Hematol., 96, 254-262. Chen, N., Kasserra, C., Reyes, J., Liu, L. and Lau, H. (2012a): Single-dose pharmacokinetics of lenalidomide in healthy volunteers: dose proportionality, food effect, and racial sensitivity. Cancer Chemother. Pharmacol., 70, 717-725. Chen, N., Lau, H., Kong, L., Kumar, G., Zeldis, J.B., Knight, R. and Laskin, O.L. (2007): Pharmacokinetics of lenalidomide in subjects with various degrees of renal impairment and in subjects on hemodialysis. J. Clin. Pharmacol., 47, 1466-1475. Chen, N., Wen, L., Lau, H., Surapaneni, S. and Kumar, G. (2012b): Pharmacokinetics, metabolism and excretion of [(14)C]-lenalidomide following oral administration in healthy male subjects. Cancer Chemother. Pharmacol., 69, 789-797. Chen, N., Zhou, S. and Palmisano, M. (2017): Clinical pharmacokinetics and pharmacodynamics of lenalidomide. Clin. Pharmacokinet., 56, 139-152. Chowdhury, G., Shibata, N., Yamazaki, H. and Guengerich, F.P. (2014): Human cytochrome P450 oxidation of 5-hydroxythalidomide and pomalidomide, an amino analogue of thalidomide. Chem. Res. Toxicol., 27, 147-156. Hirom, P.C., Millburn, P., Smith, R.L. and Williams, R.T. (1972): Species variations in the threshold molecular-weight factor for the biliary excretion of organic anions. Biochem. J., 129, 1071-1077. Ito, T., Ando, H., Suzuki, T., Ogura, T., Hotta, K., Imamura, Y., Yamaguchi, Y. and Handa, H. (2010): Identification of a primary target of thalidomide teratogenicity. Science, 327, 1345-1350. Kim, Y. and Schmidt-Wolf, I.G. (2015): Lenalidomide in multiple myeloma. Expert Rev. Anticancer Ther., 15, 491-497. Lopez-Girona, A., Mendy, D., Ito, T., Miller, K., Gandhi, A.K., Kang, J., Karasawa, S., Carmel, G., Jackson, P., Abbasian, M., Mahmoudi, A., Cathers, B., Rychak, E., Gaidarova, S., Chen, R., Schafer, P.H., Handa, H., Daniel, T.O., Evans, J.F. and Chopra, R. (2012): Cereblon is a direct protein target for immunomodulatory and antiproliferative activities of lenalidomide and pomalidomide. Leukemia, 26, 2326-2335. Murayama, N., van Beuningen, R., Suemizu, H., Guillouzo, C.G., Shibata, N., Yajima, K., Utoh, M., Shimizu, M., Chesné, C., Nakamura, M., Guengerich, F.P., Houtman, R. and Yamazaki, H. (2014): Thalidomide increases human hepatic cytochrome P450 3A enzymes by direct activation of the pregnane X receptor. Chem. Res. Toxicol., 27, 304-308. Okubo, S., Miyamoto, M., Ito, D., Takami, K. and Ashida, K. (2016): Albumin and apolipoprotein H mRNAs in human plasma as potential clinical biomarkers of liver injury: analyses of plasma liver-specific mRNAs in patients with liver injury. Biomarkers, 21, 353-362. Okubo, S., Miyamoto, M., Takami, K., Kanki, M., Ono, A., Nakatsu, N., Yamada, H., Ohno, Y. and Urushidani, T. (2013): Identification of novel liver-specific mRNAs in plasma for biomarkers of drug-induced liver injury and quantitative evaluation in rats treated with various hepatotoxic compounds. Toxicol. Sci., 132, 21-31. Rozewski, D.M., Herman, S.E., Towns, W.H. 2nd, Mahoney, E., Stefanovski, M.R., Shin, J.D., Yang, X., Gao, Y., Li, X., Jarjoura, D., Byrd, J.C., Johnson, A.J. and Phelps, M.A. (2012): Pharmacokinetics and tissue disposition of lenalidomide in mice. AAPS J., 14, 872-882. Shimizu, M., Suemizu, H., Mitsui, M., Shibata, N., Guengerich, F.P. and Yamazaki, H. (2017): Metabolic profiles of pomalidomide in human plasma simulated with pharmacokinetic data in control and humanized-liver mice. Xenobiotica, 47, 844-848. Szymańska, J.A., Bruchajzer, E. and Sporny, S. (1996): Comparison of hepatotoxicity of 1,2-, 1,3- and 1,4-dibromobenzenes: the dynamics of changes of selected parameters of liver necrosis in acute poisoning in mice. J. Appl. Toxicol., 16, 35-41. Tsukada, A., Suemizu, H., Murayama, N., Takano, R., Shimizu, M., Nakamura, M. and Yamazaki, H. (2013): Plasma concentrations of melengestrol acetate in humans extrapolated from the pharmacokinetics established in in vivo experiments with rats and chimeric mice with humanized liver and physiologically based pharmacokinetic modeling. Regul. Toxicol. Pharmacol., 65, 316-324. Weber, D.M., Chen, C., Niesvizky, R., Wang, M., Belch, A., Stadtmauer, E.A., Siegel, D., Borrello, I., Rajkumar, S.V., Chanan-Khan, A.A., Lonial, S., Yu, Z., Patin, J., Olesnyckyj, M., Zeldis, J.B. and Knight, R.D. ; Multiple Myeloma (009) Study Investigators. (2007): Lenalidomide plus dexamethasone for relapsed multiple myeloma in North America. N. Engl. J. Med., 357, 2133-2142. Yamazaki, H., Suemizu, H., Kazuki, Y., Oofusa, K., Kuribayashi, S., Shimizu, M., Ninomiya, S., Horie, T., Shibata, N. and Guengerich, F.P. (2016a): Assessment of protein binding of 5-hydroxythalidomide bioactivated in humanized mice with human P450 3A-chromosome or hepatocytes by two-dimensional electrophoresis/accelerator mass spectrometry. Chem. Res. Toxicol., 29, 1279-1281. Yamazaki, H., Suemizu, H., Mitsui, M., Shimizu, M. and Guengerich, F.P. (2016b): Combining chimeric mice with humanized liver, mass spectrometry, and physiologically-based pharmacokinetic modeling in toxicology. Chem. Res. Toxicol., 29, 1903-1911. Yamazaki, H., Suemizu, H., Murayama, N., Utoh, M., Shibata, N., Nakamura, M. and Guengerich, F.P. (2013): in vivo drug interactions of the teratogen thalidomide with midazolam: heterotropic cooperativity of human cytochrome P450 in humanized TK-NOG mice. Chem. Res. Toxicol., 26, 486-489. Yamazaki, H., Suemizu, H., Shimizu, M., Igaya, S., Shibata, N., Nakamura, M., Chowdhury, G. and Guengerich, F.P. (2012): in vivo formation of dihydroxylated and glutathione conjugate metabolites derived from thalidomide and 5-hydroxythalidomide in humanized TK-NOG mice. Chem. Res. Toxicol., 25, 274-276.